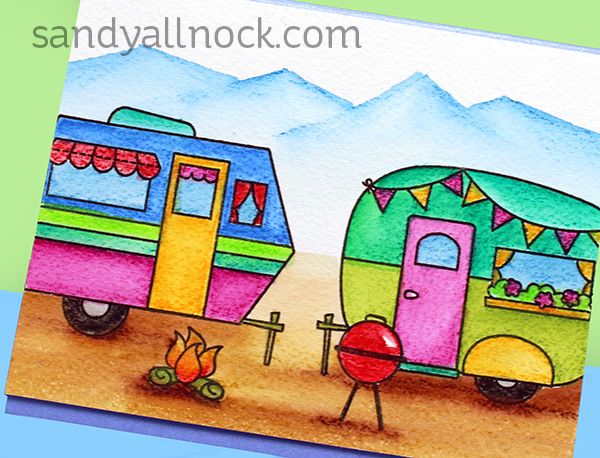 I’ve got a friend who gets *every* RV stamp set that comes out – I’m pretty sure she’ll be getting this set! So I’m kinda doing this video for her. LOL. But you can enjoy it too! Lots of happy color – and some quick mountains. Watch the video below or click HERE to see it in HD on YouTube. Simple happy color…no need for fancy thinking, just use color! This is positively wonderful. I am going to try this tomorrow, and your mountains are awesome! Ok, I don’t know about your friend, by I too love camper stamps. The irony though, is that I actually intensely dislike camping in real life. I love love love your card. It is one of my all time favorites that you have done. I cannot even STAND how cute this is!!!! Totally my fav of all time – and that’s a tough thing to say! Everything you do is stunning! 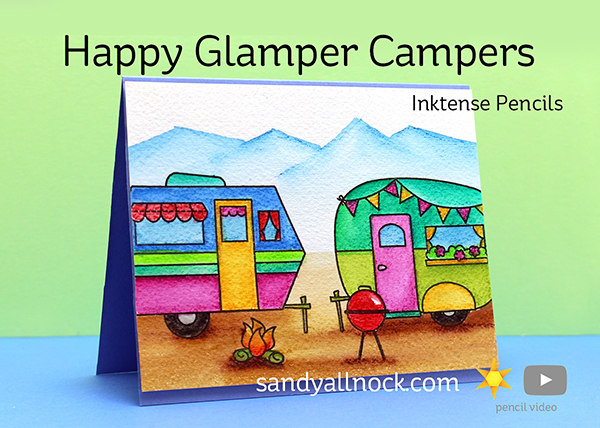 Love this card, the intense pencils are gorgeous, but so is the fun design of this card; love it! Adorable! Love the colors! Thank you for the tips! Great color choices. Amazing details bought to life. Such a happy bright card. I love it. I have the Intense Pencils but don’t use them very often. Thanks for sharing all the tips. Fun on a Friday morning! Great colors, great scene. I chuckled as you were talking about getting the watercolor pencilled areas to “melt down” – a new definition for that term, and I like this one a lot better! Let’s all get out our watercolor pencils and have a melt down today!!!! !